Now that we have two speedy reader view engines on board, we wanted to go a step further by providing a permanent reader view option for selected feeds. This is by far the number one feature request in reviews and the daily feedback we receive. In News Explorer 1.9 you can now set a preferred primary article view for each feed. You can choose between the unaltered feed article, Mercury Reader view, Arc90 Readability view, or the original website article view. Long press on the Reader view button to open the Primary view options panel for the feed of the currently selected article. Once a primary view for a feed is set, it will be the default view when you open any article of that feed. Permanent Reader view is supported by the macOS and iOS editions. The article list can now be set to Poster view, in addition to the existing thumbnail and default view options. Poster view shows a preview image under the header and summary of each article. The height of the preview image can be adjusted in the Preferences panel. Poster view is supported by the macOS and iOS editions. Automatic detection of RTL languages like Arabic and Hebrew. When a RTL language is detected, the content will be displayed right-aligned. Improved handling and display of system accent colors in macOS 10.14. Timeline view now supports the same article views as the article list. The image viewer nows extracts all images available in the current article view before displaying the viewer. This includes hyperlinks to images. Long words in the article viewer will now be hyphenated, if the language of the feed is known. This is especially relevant for languages with long compound words, such as German and Dutch. New option to start videos manually. Take note that videos in some sites only work when they are allowed to start automatically. When clicking on an image in the article viewer, the image viewer now tries to display the clicked article. Countless other small fixes and improvements, both visual and ‘under the hood’. 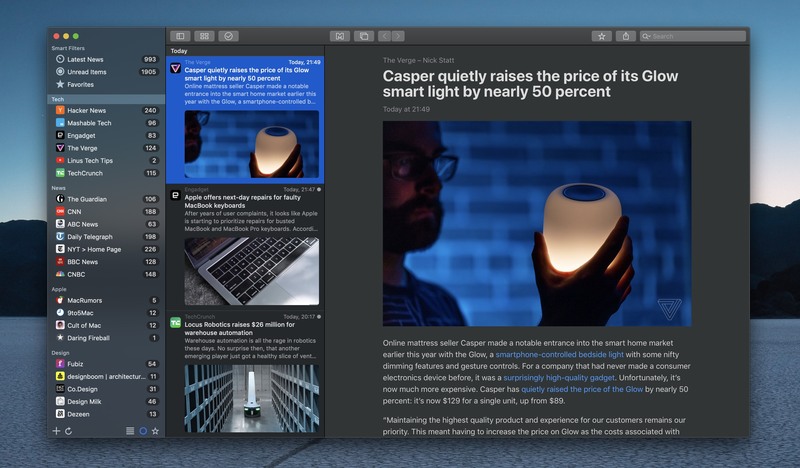 New Standard theme, which is similar to the current System theme, including automatic Dark Mode support, but with inclusion of the special sidebar and toolbar design of the other themes. This theme variant is the default theme when using macOS 10.14. Option to display unread counters in System style. The effect is only visible when using a dark theme, you’ll will see the same unread counters as in the standard Mail app in Dark mode, namely dark numbers on a light background. Fixed an issue with not making the background of in the in app browser white, when displaying regular webpages. The minimum required OS version is now macOS 10.13.6. Added support for Spacebar navigation with automatic scrolling of articles and selection of the next item. Added also support for Shift + Spacebar navigation, to do the opposite. New option Native app when available for setting Open links with to open links in their original apps, such as Twitter or Facebook. If a link doesn’t have an associated app, it will be opened in Safari view controller. All menu items in action sheets do now have icons, which makes them more attractive and easier to recognize. Action Mark all as read is now being performed immediately, without waiting for data updates. Startup of the app itself, the subscriptions list and article list has been changed. Instead of performing all necessary data actions for the next step before proceeding, it will instantly display the next view and show an activity indicator when needed. This all should result in a more responsive app and less chance for termination of the app by iOS during startup, when a large database needs to be opened. The maximum article list width is now 500 pixels when using an 11-inch iPad or larger. Removed built-in Instapaper and Pocket sharing options. Please install the related apps to restore sharing to these services. The minimum required OS version is now iOS 11.4. The Reader view engine in both the tvOS and watchOS versions has been updated in order to use a Mercury Web Parser service hosted on a Betamagic server. Unlike macOS and iOS, these platforms don’t have the necessary frameworks on board to support working Reader view engines within the app. The storage periods for unread and read items can now be set to Forever. Please note that this will result in a larger database, more iCloud storage space, longer initial synchronization times and in some cases degraded performance. Fixed a date interpretation issue with Atom feeds. This also fixes a ‘reoccuring of old articles’ problem when using the classic Daring Fireball feed, instead of the superior JSON feed.